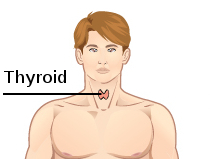 The thyroid is one of the largest endocrine glands in the body. This gland is found in the throat. The thyroid controls how quickly the body burns energy, makes proteins, and how sensitive the body should be to other hormones. The principal hormones it makes are thyroxine (T4) an triiodothyronine (T3), which is more active. These hormones regulate the growth of many systems in the body. T3 and T4 are synthesised from iodine and tyrosine. The thyroid also makes calcitonin, which plays a role in calcium homeostasis. Hypothyroidism (underactivity) - Hypothyroidism is a condition in which the thyroid gland does not make enough thyroid hormone. This page was last changed on 6 January 2019, at 16:25.